As many of you know, the 25th anniversary of the original Legend of Zelda’s release in Japan is tomorrow, the 21st of February. With three expected Zelda releases, Ocarina of Time 3D, Link’s Awakening on the 3DS e-shop, and Skyward Sword, this year will certainly be one of Zelda’s best ever. 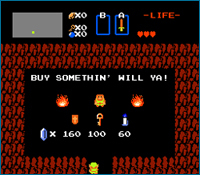 Another of Link’s most commonly seen items, the Boomerang, like the Bomb, was also given little dignity in Zelda 1 – it was just an optional pick-up you could find in one of the rooms of the first dungeon, and first-time players might have missed it entirely if they just ran straight through without stopping to slay all the enemies in that particular chamber. You could get the farther-traveling, faster Magical Boomerang in Level 2, as well, but it was similarly just left on the floor after a Goriya battle. But the Boomerang has gained much more recognition and utility in the games to come along afterward, as it’s been used for more than its original purpose of temporarily stunning foes in place. It’s become a puzzle-solving staple, sometimes capable of hitting multiple targets in flight before returning to Link’s hand, sometimes imbued with the power of wind, sometimes directed in flight by hand-drawn paths on the DS touch screen. Who would have thought Nintendo would get such mileage out of a simple, optional little piece of optional curved wood, originally just left lying on the dungeon floor? Be sure to check out the whole article for more great features. They even describe how revolutionary it was to have a save feature, and the fancy gold cartridge that held the game. I appriciate that attention to detail in a comprehensive article such as this. Let us know your favorite things about the 1st game in the comments below.